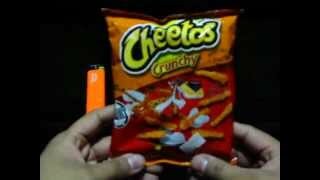 Video: Are Cheetos Really Flammable? Here’s an experiment to see if Cheetos really are flammable, as some videos claim. So hey, I thought I would see for myself because, yeah, the pyromaniac in me. Plus, I had a couple of minutes to spare. Show the video to your kids, then ask them if they still want to stuff themselves with junk food all the time. In medio stat virtus. Moderation is key. Someone on Reddit Philippines Facebook Group suggested I also try this on other junk food, such as a local favorite, Leslie’s Clover Chips. Possibly. I made this Cheetos video just for the kicks. Then again, in my own Clover Chips eating experience, they might not be as flammable as Cheetos, if at all. I think it follows that the greasier the shiz, the moar likely that it’s flammable. Further Experiments: BURN ALL THE THINGS! This entry was posted in Food and Drink and tagged cheetos, flammable, inflammable, junk food on September 8, 2014 by E.J. Padero.